We just bought this last night and my daughter didn't want to get out of it, haha! I'm so happy I found this, its easy to use and assemble. I have major back problems and I can use this and carry the baby without any issues. I have no pain associated with using it. I've also had to wash it and it came out looking great. I would recommend this anyone. Im so happy I found this, its easy to use and assemble. I have major back problems and I can use this and carry the baby without any issues. I have no pain associated with using it. Ive also had to wash it and it came out looking great. I would recommend this anyone. I bought this carrier for my baby when she was six months old. Carrier was very comfy for both me and her and she loved being carried around in it! I liked that it was very easy to get on and off. Baby felt very secure in it and I never experienced back pain. When I put my baby in it she was very happy and I was able to get so much done. I was very sad when she outgrew it! I occasionally use this carrier. It is well-made and has great features like the drool bib and included "infant insert". We use it mostly for front-facing as most ergo-style carriers do not support front facing. Amazing & great for breast cancer survivors too! The carrier fits nicely on small frames but if a large person such as a Father tries it on, it's quite tight and not very easy to get in and out of. I recommend that all expecting parents get a Britax Carrier. Our little one loves facing in for a nap but when she is awake, she wants to see the world. I love that you can face the child either way. It also helps distribute the weight of the child, which has helped save my back. I also like that you change out the "bib" for washing & still use carrier. My husband loves wearing the babies, too. We purchased this as a way to take our baby for walks and keep him comforted by being close to us instead of in a stroller. It's very comfortable to wear (and I wear it often, lol) and easily adjustable. Between me and daddy (I'm 5'4 and he's 6'2) it takes him under a minute to readjust it when he's taking our son for a walk. Our baby has fallen asleep in this very often so he can attest to the comfort and as he has grown, we've noticed the durability as well. We haven't had any issues and I would definitely recommend this to anyone looking for a baby carrier. I am using this carrier for my second child (2 months). I used this for my first (3 yrs now) until he was a year old. This is a must buy for a new mom. While on leave, I use it while I am getting wash done and cooking dinner. I use it to bring my infant to the grocery store as well. It is just super convenient!! I never have back pain with it regardless of size of the child. We purchased this baby carrier last week and it's the best! Easy to use, clean and very convenient. We received this carrier for free when we purchased our B-agile travel system. We loved it and so did our baby girl. I love how snugg she fit with the infant insert and how she was able to grow into the carrier. 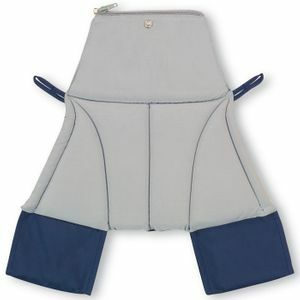 It is very comfortable and distributes the weight evenly so your back or shoulders don't feel stressed. My husband and I both wore it. Super easily to adjust to fit and easy to but baby in by yourself. We also purchased the wide seated insert to give her a more natural seated position. Overall this is a great carrier! We used this carrier 3 years ago with our first daughter, and I am already using it with my second born daughter, who is now 4 weeks (9.5 lbs). I highly recommend! It's great with the two kids especially. I am able to get the older child ready for and into bed easily while wearing the baby. About 90% of the time, the baby falls asleep instantly in this carrier! She has a cold now, so it is especially coming in handy for keeping her upright and more comfortable while she naps. I couldn't wait to use the carrier again with the new baby, I am literally wearing it while writing this review. Perfect for our city living needs! This carrier is perfect for our city living needs. It's great for hassle free Metro and bus rides. It makes getting to and from daycare, shopping and other outings worry free as you can just get right onto the Metro or bus without having to worry about closing a stroller in time before the doors close. 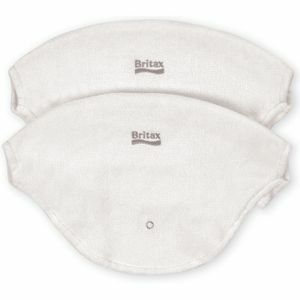 When it comes to carrying your baby, at BRITAX we know that the comfort of both parent and child are crucial. That’s why BRITAX, the leader in child safety, has designed the BRITAX BABY CARRIER to provide the highest level of long-wearing comfort for both you and your growing baby. 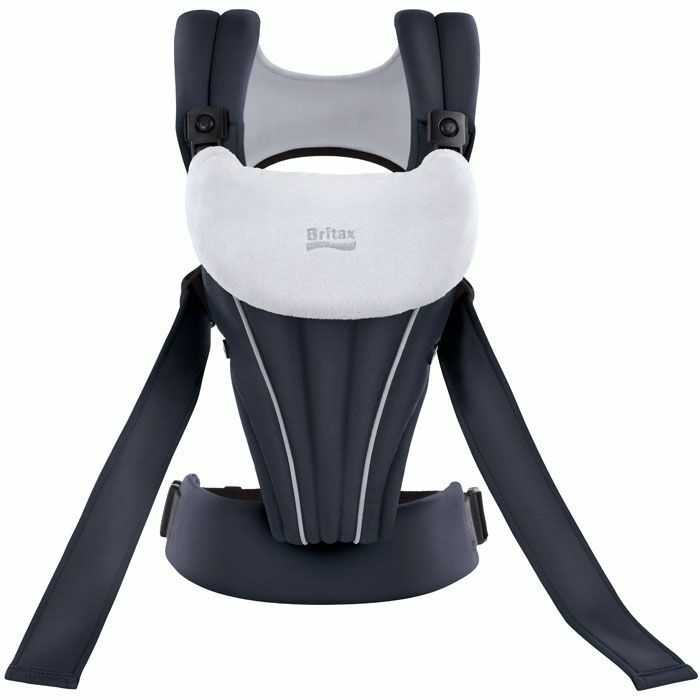 The BRITAX BABY CARRIER features the CarryLong™ System, which reduces the risk of back and shoulder strain during extended wear by distributing weight across the shoulders, back and hips. Not only does the BRITAX BABY CARRIER offer superior levels of comfort, but it is versatile as well. The ergonomic carrier allows you to face your baby inward towards you or outward to face the world, and accommodates infants from eight pounds to toddlers up to 32 pounds. Coming from the leader in child safety, the BRITAX BABY CARRIER has been engineered for safety as well. Adjustable head support and leg loops provide head and neck stability for younger infants and a secure fit for smaller babies. A secure harness and pouch design ensures that baby will stay securely within the carrier. With the BRITAX BABY CARRIER carrying your growing baby has never been more comfortable or easy.